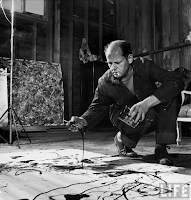 Paul Jackson Pollock, better known as Jackson Pollock, was born on 28th January 1912 in Cody (Wyoming) and died accidentally on 11th August 1956 in The Springs (New York). He was an influential American painter and a major figure in Abstract Expressionism. He was especially known for his unique painting style called drip painting or dripping. In 1945, he married the artist Lee Krasner, who was also an Abstract Expressionist. After their wedding, they moved their “Studio” in The Springs. He had a volatile personality, and struggled with alcoholism for most of his life. At the age of 18, he made a decisive move to New York where he attended lectures at the famous Art Students League of New York under Thomas Hart Benton. Benton’s influence may be traced back in Pollock’s work. 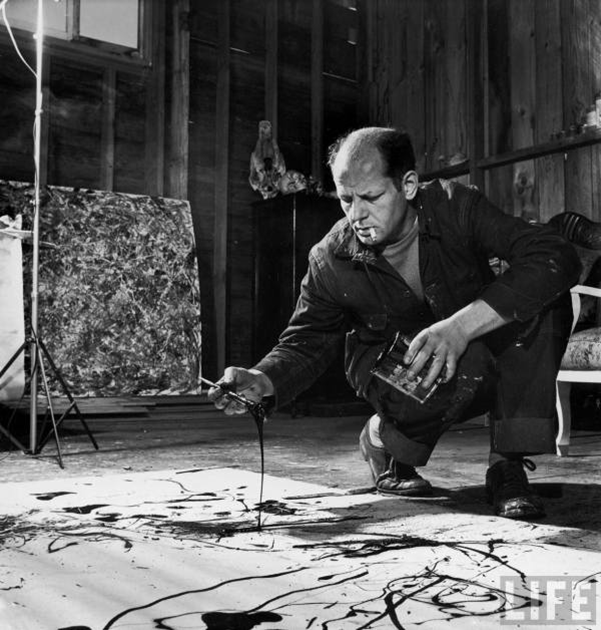 Pollock worked for the Federal Art Project from 1938 to 1942. After his move to The Springs, Pollock developed his famous painting style, also referred to as ‘action painting’. His “drip technique” emerged abruptly in 1947 and lasted until 1950 when he suddenly abandoned it. Instead of using the traditional easel he laid his canvas on the floor so that he could walked around it. He did not carefully apply paint onto the canvas, but poured and dripped it, using tools such as sticks and knives, or an impasto with sand. Pollock maintained not to be aware of what he was doing while painting. According to the surrealist theories of automatism his work could be regarded as the direct expression of his unconscious moods. 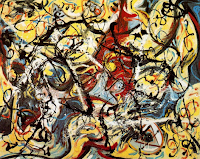 Pollock has not given a title to all of his paintings but numbered certain of them. He wanted people to look at the paintings and not to think about the title and to search a deeper meaning for them. He also wanted people to stop looking for representational elements in his paintings but to draw the attention to the physical act of painting itself. 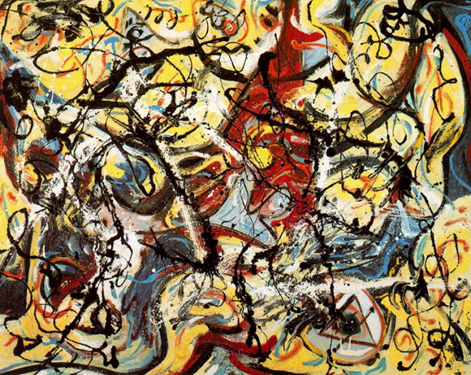 Pollock created most of his masterpieces during his ‘drip period’ (1947-1950). In order to tackle his drinking-problem, Pollock underwent a Jungian psychotherapy. We can see many Jungian concepts in some of his drawings. Others also claimed that certain paintings displayed the properties of mathematical fractals. He is alleged to have been influenced by the Native American culture during his childhood and claimed that moving around the painting is similar to the methods of the Indian sand painters of the West. From the 1960s onwards, he was recognized as the most influent figure in the most important American painting movement of the century. Nowadays, Pollock is not only a source of inspiration for other painters and artists, but also for fashion designers and vintage nuts. Pollock painted ‘Composition with pouring’ in 1943 on a 6.36m x 5.63m canvas. It clearly illustrates dripping technique and the genre of abstract painting. It is displayed in the gallery of the Hirschorn Museum in Washington. The painting was done in 1948 on a 2.4m x 1.2m sheet of fireboard. Brown and yellow paint on the top of it form a nest-like appearance. It used to be displayed at the Museum of Modern Art before being sold for $140 million in 2006.